St. Mary’s Macroom claimed the TESCO HomeGrown All Ireland Junior B title after a titanic struggle against St. Joseph’s Rochfortbridge in a windswept Sean Treacy Park. The difficult conditions did not get in the way of what was an exciting encounter between two excellent sides. 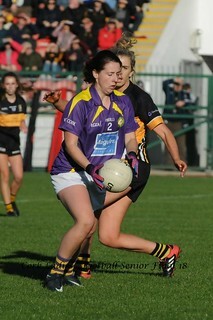 St. Joseph’s had the advantage of the wind in the first half but they struggled to break down the St. Mary’s defence. Rochfortbridge enjoyed the lions share of the possession thanks to a great performance of the midfield pairing of Dawn Hannon and Nicola Judge both of whom got on the scoreboard in the first half. However, St. Mary’s scored three first half goals through the excellent, Mairead Corkery, Niamh Duggan and Claire Murphy’s first of the match. Rochfortbridge were left to rue their missed opportunities as they went into the break 5 points behind despite having had the advantage of the strong wind. 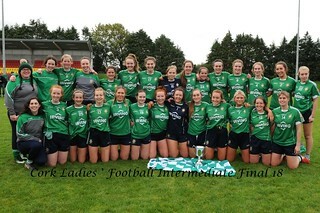 St. Mary’s enjoyed the bulk of the possession in the second half as they had a strong breeze at their backs but St. Joseph’s stayed in touch throughout the game and were thrown a lifeline when Michaela Brady finished to the back of the St. Mary’s net to leave a point between the sides. The defining moment of the match came from the resulting kick out when St. Mary’s regained the ball and broke up the field where Claire Murphy was on hand to grab her second goal of the match and was followed by Rachel Horgan whose second point proved to be the insurance score. Dawn Hannon, Amy and Lisa Cully were among the top performers for St. Joseph’s whilst Mairead Corkery, Niamh Duggan and the outstanding Aisling Kelleher were to the fore for the Macroom team. The experience of several of the St. Mary’s Macroom girls in winning the TESCO HomeGrown Post Primary Schools Senior B final last week was vital to the success of the Macroom team as they completed the remarkable achievement of claiming their second title.